Mr Crimson Rosella (Platycercus elegans) calls by for breakfast. 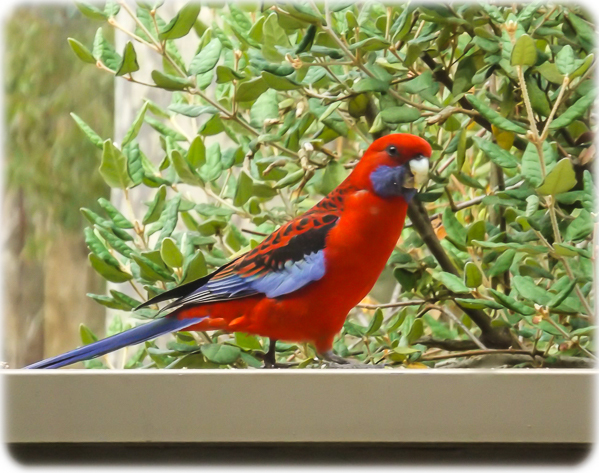 The Crimson Rosella’s have been gradually making their way to be included in the feeding on the front deck. Lets not be mistaken though the Lorikeets still own the space, try to take on the King Parrot and will not tolerate Pidgeons, Doves, White Cockatoos etc. A Crimson Rosella started eating the left overs from the King Parrot and with the Lorikeets nowhere he stayed for ages. There are two of them nesting high up in one of the gum trees but they rarely venture down – preferring the berries and correos tree. Once the Rosella started eating it was clear excellent manners were at play – putting the seed in his mouth with his foot in a sort of reverse scissor action and all the time staring through the window as if to say..”I know you are there…! The Rosella stayed for a while then yes – you guessed it the Lorikeets arrived back along with the King Parrots and a couple of doves.